A weekend-based Internet-enhanced version of the MBA program exists as an alternative to the traditional part-time evening program. This program is a 48-credit-hour program for professionals with busy work or travel schedules. Students meet on campus monthly, with the remainder of the interaction between instructor and students taking place online. Students proceed through the program as part of a cohort group and complete the requirements for the degree in two years. The traditional (evening) MBA enrolls students three times a year, in the fall, spring, and summer terms. For the professional MBA and the international MBA, classes only start once a year, in the fall term. To apply, all programs require undergraduate transcripts, two letters of recommendation, and GMAT scores. Admission is selective, with only ab...The traditional (evening) MBA enrolls students three times a year, in the fall, spring, and summer terms. For the professional MBA and the international MBA, classes only start once a year, in the fall term. To apply, all programs require undergraduate transcripts, two letters of recommendation, and GMAT scores. Admission is selective, with only about 60 percent of applicants receiving an offer of admission. To be competitive, students should have a GMAT score of 500 or better, and an undergraduate GPA of at least 3.0. Promising students who fall short of these minimum standards may be considered for provisional admission. With a convenient evening or weekend schedule, UMSL attracts a lot of working profes­sionals, who are “busy juggling work, school, and home responsibilities.” While they have worries outside the classroom, this is a “hardworking” bunch, and “students are focused on doing well in their classes while also working a full-time job.” When course work requires collaboration between classmates, students are “friendly and profession­al,” and they “work well together in groups.” By and large, “UMSL is a commuter school” and most people “are there to learn and leave.”As a part of the largest research university in the St. Louis area, UMSL has an “ethnical­ly diverse” and active student body. As graduate business students, MBA candidates have access to numerous facilities on this 350-acre campus. For example, “The campus houses the largest Performing Arts Center in the Saint Louis Area. There are weekly and sometimes nightly events on campus, available for free or at a discount to UMSL stu­dents.” Within the business school, however, students would like the administration to “upgrade our facilities and buildings.” Located in suburban St. Louis, this school offers excellent access to the largest metropolitan center in Missouri. 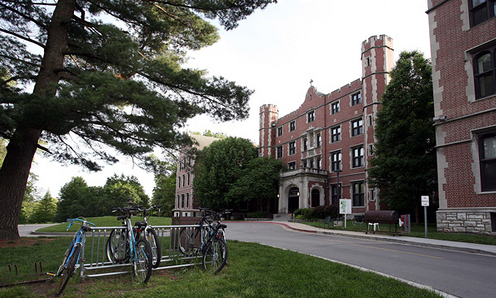 However, some students feel the campus is “set in a rough part of St. Louis,” so there aren’t many options for recreation or nightlife in the local area. Most UMSL programs are designed for working professionals who are looking to advance in their current position, rather than find a new job. However, for those seeking a career change, the UMSL Office of Career Services helps undergraduate and graduate students prepare for the job search through career counseling and job preparation work­shops. The Office of Career Services also connects the university with local employers through networking events and job fairs. (At recent UMSL job fairs, numerous prominent companies attended, including Aflac Insurance, AT&T, Bank of America, Boeing, Commerce Bank, FedEx, Maxim Healthcare Services, Mutual of Omaha, Northwestern Mutual, Sherwin-Williams, St. Luke’s Hospital, Target, Walgreens, and many more.) Through Career Services, students can also post their resume online, where it can be elec­tronically matched with recruiting companies. Want more info about University of Missouri - Saint Louis College of Business Administration Part Time MBA? Get free advice from education experts and Noodle community members.